WINNERS is about two people who win the lottery, although it’s not about them blowing through their money and going broke, and it’s not a love story, not exactly. It started for me when I heard about a couple of strangers hitting the same mega-jackpot, and I got to imagining how these two, with nothing in common except their win, might discover they needed to find each other very badly for reasons I figured would not be clear to them. And that they ought to be opposites in every way--age, class, gender, worldview--and that their pursuit of each other should be secretive and quirky. This evolved into my novel, about the two of them--the struggling, underemployed young woman who is caught up in a robbery and shooting as she's buying her lottery ticket, and the affluent, reclusive middle-aged man who panics when he wins. They do not know it, but they are each other’s only hope of moving past the old traumas that haunt them. Their story is about relationships, family, grief, survival, and money--our assumptions about money, the ways money and class shape us, the effects of income inequality. It is set partly in Maryland, in working class suburbs that evoke Glen Burnie, and in waterfront neighborhoods that look like the bluffs above the Severn River. WINNERS is complete, about 100,000 words, and I am currently working on revisions; if published, it will be my first novel. PIRANHAS & QUICKSAND & LOVE: short storiesTravel Writing: "Wales Is Rock" Travel Writing: "Walls to Nowhere"Essay: "Airborne"Personal Essay: "Song for a Boy Not My Own"Essay: "Splendor in the Tallgrass"Travel Writing: "Windfall"Travel Writing: "Gringa Morisca"Essay: "Hearing Voices"Essay: "Rhythm"
Piranhas & Quicksand & Love is my short fiction collection published in 2016 by Press 53. The book collects fourteen stories across more than a decade of work, including stories originally published in The Antioch Review, Glimmer Train, Rosebud, The Baltimore Review, and other journals. The stories feature characters across a range of gender, age, ethnicity, class, and experience, all wrestling with what I truly think are the two great tasks of life, for all of us: connecting with others, and making meaning out of the raw stuff of human experience. The Washington Independent Review of Books called the book "an outstanding collection of tales about the pitfalls and rewards of human connection . . . . Read this book to savor its beautiful language, to drink in its gentle defiance. 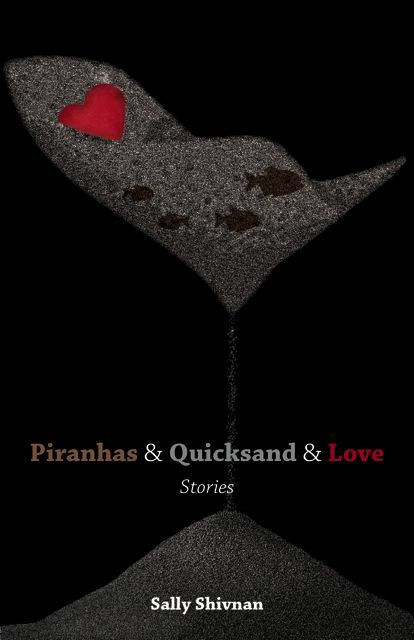 Piranhas & Quicksand & Love calls readers to ride the waves of a sea besieged by predatory behavior and natural disaster. To sail on, nevertheless, toward love." Author Richard Bausch commented this way: "Sally Shivnan's prose is so clear, and governed by a hand so precisely attuned to the demands of the story, that the words seem to disappear, and you look through them without quite having the sense that anything is between you and the people she's created. These stories will take hold of you from the first line. Each one provides what Peter Taylor once said all good stories provide: superior entertainment." This is the final proof, before it went to press, of my short story collection PIRANHAS & QUICKSAND & LOVE, published in 2016 by Press 53. Travel Writing: "Wales Is Rock"
This essay about the people, history, and geology of Wales appeared on the literary travel writing website LetsCarryOn.com in 2013. Writing about place is just about my favorite thing to do. I love landscapes--wild and urban, domesticated and untamed--and the connections between landscape and the people who live there, the ways land and sea and sky shape culture. My travel essays have appeared in The Washington Post, Miami Herald, Nature Conservancy Magazine, Washingtonian, Saturday Evening Post, baltimore.org, and many other publications and websites, and in literary journals including The Georgia Review as well as in the anthology series The Best American Travel Writing and Travelers’ Tales Best Travel Writing. Travel Writing: "Walls to Nowhere"
This essay about Ireland's curious, remarkable folly buildings tells the story of the aristocrats who built them but also the story of the Irish people today who have inherited them. It appeared in The Saturday Evening Post in 2012. This is about stuff you see out the windows of airplanes. It originally appeared in The Georgia Review and was selected for inclusion in The Best American Travel Writing 2006. Personal Essay: "Song for a Boy Not My Own"
This is a personal essay, about the wonder and weirdness of being an aunt rather than a mother. Essays like this one, because they're so personal, have a different "flavor" than a lot of my travel writing, which is often quite personal too but tends, I suppose, to look outward rather than inward. This essay appeared in Superstition Review in 2010. Essay: "Splendor in the Tallgrass"
I wrote this on assignment for Nature Conservancy Magazine, which was unusual for me--with some exceptions I have tended to write my nonfiction pieces "on spec," following my own star and then hoping that later that star will find a home in the right constellation somewhere. The essay is about some of the last remaining tallgrass prairie on the Great Plains, and it was a wonderful honor to write it and to work with some terrific Nature Conservancy biologists in researching it. I wrote this for Nature Conservancy Magazine. It's about some of the last remaining tallgrass prairie on the Great Plains, and it was a great honor to write it and to work with some terrific Nature Conservancy biologists in researching it. This tiny little essay--800 words--was one I wrote for a magazine that ended up not using it, but I've always loved it--it's about an experience with an avocado, but like any piece of writing it's about so much more than what it's about. This tiny little essay--800 words--was one I wrote for a magazine that ended up not using it, but I've always loved it--it's about an experience with an avocado, but like any real piece of writing it's about so much more than what it's about. This essay recounts two visits to the great Moorish palace the Alhambra in Spain, one of the most magical sites on Earth. It's an older essay, but a favorite, very near to my heart, I guess because it's about the beauty of this astonishing place but also about the beauty of being alive, of being in the world. It was selected for inclusion in Travelers' Tales Best Travel Writing 2005. I've never written much about my years in nursing--only a couple of projects that effectively exorcized those ghosts for me. This is one of those pieces, an essay about life as a telephone triage nurse, which I did for six years at the end of my nursing career, to support myself as I was trying to morph into a writer and teacher. I circulated it to some nurse friends, but never tried to publish it. Some things you just don't. This is an essay that started as a sort of journal--I seem to be incapable of writing anything that I don't end up shaping into an essay; in fact, most of the joy of writing for me is in the shaping of raw experience and observation into stories, whether fiction or nonfiction (I tried blogging and it wasn't for me--not enough shape to the form--I notice that the blogs I like best are the ones that present beautifully crafted micro-essays). This essay "Rhythm" is about my experience training to do a month-long bike tour in Hawaii a few years ago. It's another thing I never tried to publish--too personal and too particular somehow--but it's one of my favorite writing projects ever. Maybe one reason I'm proud of it is that it's kind of a classic story of triumph over oneself--I'm not naturally athletic, so to take on this bike training was a big deal, and this essay/journal is powerfully honest, I think, and, in its own way, powerfully celebratory.